The Culinary Director of the much loved and iconic Lake House Daylesford has been credited with kick starting regional destination dining in Australia. A long term champion and mentor to small Australian producers, Alla’s menus have reflected and named local and seasonal suppliers long before the practice became the common marketing mantra for many that it sometimes is today. Her restaurant, the beating heart of her boutique hotel and gourmet retreat, Lake House in Daylesford, continues its decades long run of awards and placements on many of the national “best of ...” lists and now boasts more than 70 accumulated Chefs Hats. Alla is an author, a champion of regional economic development and young people in the industry. She chairs the panel for the Victorian Age Good Food Guide Young Chef of the Year and has been a member of the National Judges panel for the delicious. Magazine Produce Awards since their inception. 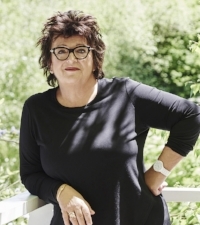 Alla’s personal Awards include – 2 Living Legend Awards: 2 Outstanding Contribution to the Industry Awards; Several Awards for Professional Excellence: She has also been admitted as a Member of the Order of Australia (AM) for her service to the industry. This year she releases her next book Lake House: Three Decades On.